Doesn't pull any punches, huh? 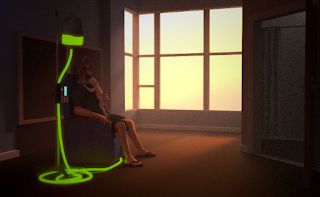 Either someone around here is chopping onions or I'm writing about That Dragon, Cancer. There's definitely a lot to dig into with this game. It's not often that a game with such a personal message breaks through to the mainstream consciousness, but I'm glad that it's this one. As mean as this sounds, it's not because I think it's a particularly elegant game (playing it is downright clunky). Instead, I admire the willingness to deal plainly with a tough subject and to incorporate religion so unapologetically. This same ethos applies to the disease itself. True there's lots of doom and gloom, but there's also messages of hope, absurdity, and mundanity mixed in there. Cancer doesn't really stop life, it just becomes part of it right alongside family dinners and running errands. The battle against the dragon is one of attrition. I want to reiterate the strength of a particular scene: the cards in the hospital. At a certain point you can read through dozens and dozens of cards written by those who lost loved ones to cancer. These cards are scattered throughout a hospital and they are everywhere, strung like mournful garlands across every doorway and scattered across every flat surface. Seeing all of them collected in one place was incredibly impactful. Thinking about all the loss and then thinking about how it related to my own experiences was overwhelming and I had to leave the virtual room. It's intense, but I highly recommend it. It's not often you get a game that feels so honest.